While the non-marking rubber sole & the water friendly EVA upper tie in technically, the classic look gains entry into an exclusive industry with rich traditions. While the non-marking rubber sole and the water friendly EVA upper tie in technically, the classic look gains entry into an exclusive industry with rich traditions. There never was a great man yet who spent all his life inland. Not only the incredibly light weight, but the versatility both in function and look, will place this shoe in your luggage. HEXTRA-GRIP traction outsole provides an extremely low profile performance, offering the ultimate connection to the ground with amazing balance. Reduce leg fatigue for greater performance on the long haul. The light weight, flexible EVA material keeps you light on your feet, and comfortable before, during, and after your outing. Biion's HEXCELL nano molecular EVA technology forms to your foot giving you a performing shoe with a precision fit. Maintain comfort throughout your day. Biion begins by keeping your foot cool with strategically placed ventilation holes throughout the shoe. Look inside. The massage nodes within every Biion shoe give your feet a therapeutic sensation with every step. Dual density, energy-return midsole.  The Biion shoe works with you, allowing for the natural movement of your feet through every step. Biion’s HEXTRA-GRIP tread provides outstanding traction, strength and stability in every activity.